It's impossible to say enough good things about Evangelion. GAINAX studio, the company behind such groundbreaking projects as Wings of Honneamise, Gunbuster and Nadia: Secret of Blue Water returns to television work with this series. An excellent story frequently told with furious abandon, this series of 13 tapes documents (among other things) beings coming out to the sky one day intent on showing humanity the error of its ways, and of humanity fighting back with everything at its disposal. That includes buildings that slide underground and piloted prototype robot warriors...with extension cords. The only criticism that can be made is that unlike Gunbuster and Nadia, the ending of the TV series is pretty disappointing. Fortunately, they made The End of Evangelion to replace the final two episodes of the TV series, which more than made up for the original disappointment. The above description came from The Right Stuf International 1997-1998 Catalog, and was edited by yours truly (contact me). Ok, here's the story folks. Evangelion takes place in the future 2015, 15 years after the famed, "Second Impact". Shinji Ikari, a somewhat lonesome boy, is standing around in the deserted streets of Tokyo-3. This openeing scene marks the beginning of a voilent, dramatic, humorous, and just plain, heart-touching series. The movie itself is centered around one of those "secret" organizations. This particular organization is called NERV. Their mission is to defend the planet from unknown threats. I won't say too much 'cause my friend wanted this to be an intro not a spoiler. Some of the characters are Shinji Ikari, the lonely kid; his father, head of NERV; Misato, Shinji's guardian and friend; Rei, a mysterious pilot; Asuka, an egotistical pilot; and of course, the EVA units! The series is made up of 26 half-hour episodes. The Movies are called, "Death and Rebirth" and "The End of Evangelion"
I will be contrary here and disagree slightly with the very enthusiastic reviewers. NGE is one of the most impressive things ever animated. The effort that was put into it on every level, from music to voice acting to art to animation, is awe-inspiring. The script and plotting are intelligent without being pretentious--at first, anyway. But the series gets derailed right around Episode 24 and goes spiraling down into the Black Pit of WTF. There are rumors about the reasons for this, and if you're an anime fan you've probably heard them already. And if you didn't like the way NGE ended (and most viewers didn't), then "Death and Rebirth" and "The End of Evangelion" will probably leave you so frustrated that you may want to put your fist through the TV screen. Likewise, there are rumors about why Hideki Anno made these artistic choices, which I won't repeat here. You've probably already heard them anyway. Ultimately it's a flawed masterpiece. When it is good it is breathtaking. It isn't hyperbole to say that, once you've seen it, you will probably never look at animation quite the same way again. But the end of the series is ghastly, and the movies are everything that was bad about the ending multiplied a hundred times, combined with even more impressive animation, art, voice acting, and music. It's extremely frustrating and it could have been so much better than it was. According to the Old Testament of the Bible, Angels are the servants of God. It also represents the 12 disciples of Christ in the New Testament. Based on the Old Testament of the Christian Bible, Adam was the first man to have been created by God in his own image. The organization called "Seele" means "Soul" in German. Evangelion is a word taken from the German word: evangelium, which has religious connotations meaning Gospel. It is also used as a slang to mean Absolute Truth. The A10 nerve, the nerve Shinji uses to synchronize, is also the nerve that produces natural morphine in our brains, also known as the pleasant section of the brain. It is also the section that manages our long term memories. 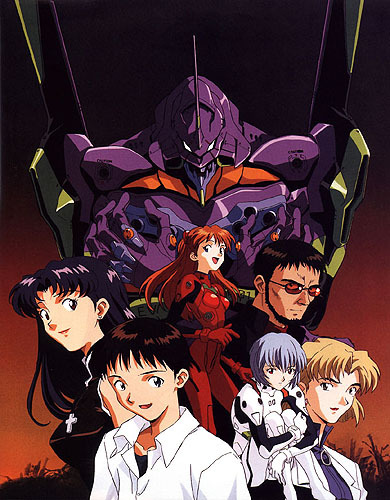 The four main eva's (Unit 00, 01, 02, 03) are based on the Guardians of one of the gate's of hell. One was a Cyclops (Unit 00), another had a horn and gnashing teeth (Unit 01), another had four eyes and the worst temper of them all (Unit 02), and the last one was black in color and had unusually long arms (Unit 03). The above description came from Damien Van Zan, and was edited by yours truly (contact me).